I'm relatively new to this forum, so first of all, hi there! Now, here's a really strange issue that many people have, but can't seem to find a solution. I'm looking to find a solution once and for all. I have a Model 2 PAL Saturn from Spain. It has a Phantom Universal Modchip and a 60hz mod. About a month ago my Saturn's PSU suddenly died. Turns out it was the AC/DC transformer (that yellow and black block in the board), can't fix it. Replacements are hard to come by where I live, so that's out of reach for the time being. I decided to go the DIY route and buy a custom PSU from a nearby electronics store. Because my Saturn is one of the later models, the original PSU required only a 5V rail (console) and a 9V one (forcing 4:3 aspect ratio on SCART output) but it turns out I can go without the latter, so I just needed 5V. I made sure there was no voltage drop. I double and triple checked everything, and it seemed to be working just fine. Once it was all hooked up, I was delighted to see my console power up again. But things only went downhill from there. The console seemed to freeze at the boot animation or on the menu every single time I powered up the console. But the disc motor kept responding. (That means I can stop the disc and get it to spin again while the console is frozen). If there's no disc in, I can reach the menu, but as soon as you insert one, bam. Frozen. Doesn't matter if it's an audio disc, CD-R game or original game. 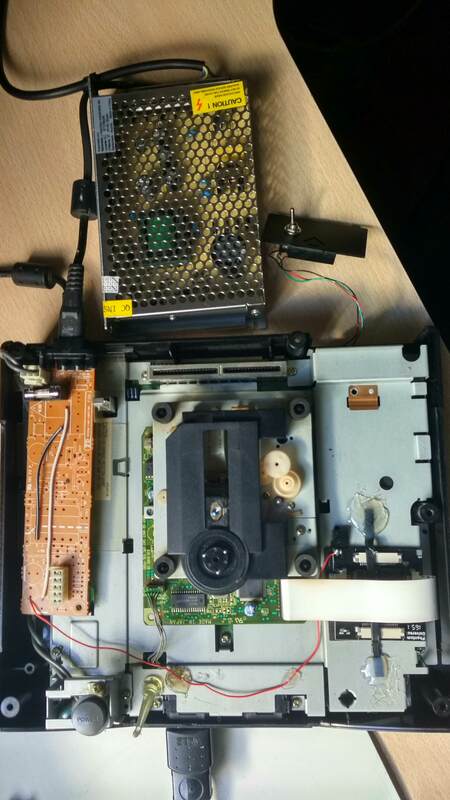 -Disassemble the whole unit and look for main board issues. -Solder 5V rail directly onto the console's pin header instead of passing through the original board. So, is this fixable? Can anyone guide me through what could possibly cause this? Last edited by sestrenexsis on Wed Dec 27, 2017 2:21 pm, edited 1 time in total. I would definitely test without the mod chip installed and see what happens. Definitely, that's gonna be one of the first things to test now. I'll see if I can get it done soon, and I'll report back the results. UPDATE: Just tested without modchip. No changes whatsoever, still freezes. That being said, the modchip is not causing the issue. One thing I haven't mentioned in the main post is that, whenever it's reading a disc, the CD drive makes a beep sound. And I have no idea where the beep comes from. I would leave the mod chip off for the rest of your testing until you find the problem, just to keep it ruled out. Are you sure the 9v rail is only used for the PAL video mode selection? Nothing else uses it? 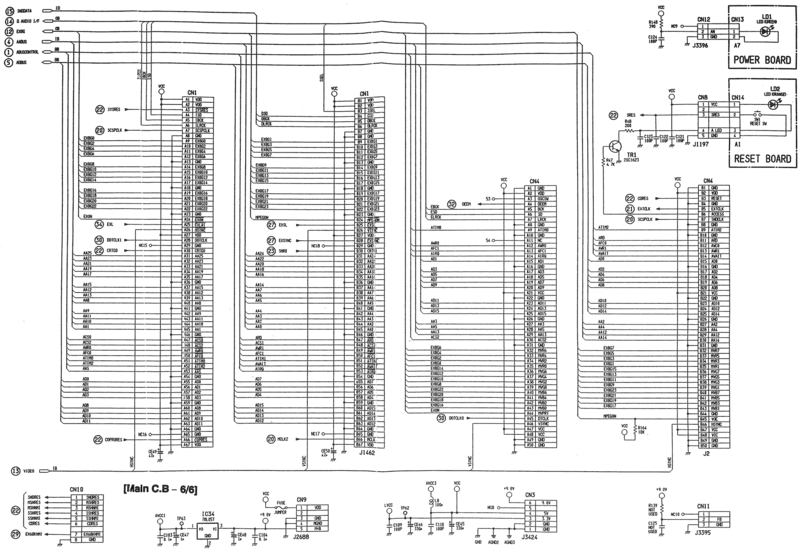 It's always best to work on electronics with a schematic, when possible. 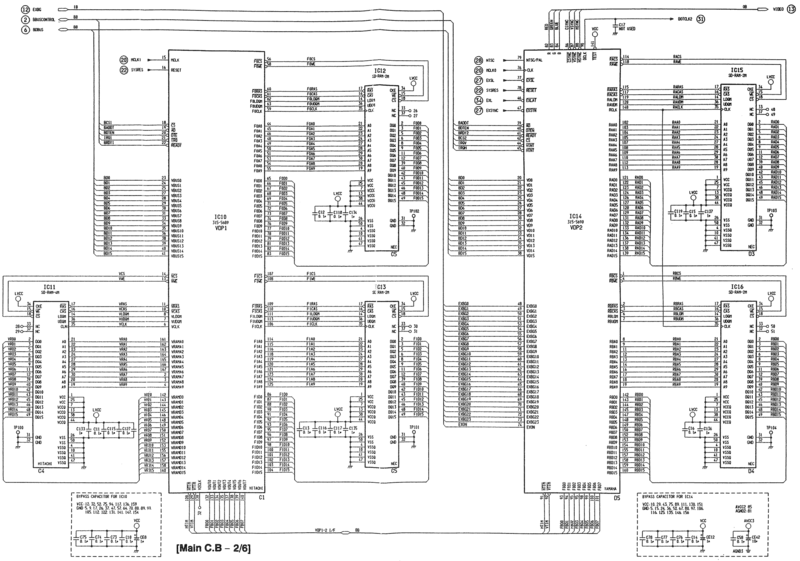 These are for the VA0 PAL unit, and it looks like you have a different revision, but any changes to the schematics between revisions were likely very subtle, if there were any at all. Based on these two pages, the VDP RAM is being powered by a 3.3V line. It looks like there's a test point (TP62) that you could meter to see what, if anything, is powering those RAM ICs. The freezing on boot would make sense to me, if the VRAM is essentially absent. there is no 3.3v rail on my board. It's a later revision that only has 5 and 9 volt rails. Some thorough research hinted me towards voltage ripple being the issue. When I measure using the multimeter when reading a CD, the voltage always fluctuates between like 4.98 and 5.1. The PSU I got seems to be very stable (measuring that alone gave me a rock solid 5v), so my guess is that something in the middle is making it fluctuate, and therefore freeze. And yes, I'm 100% sure the 9V are only used for the SCART 4:3 thing. Last edited by sestrenexsis on Wed Dec 27, 2017 1:56 pm, edited 1 time in total. I would've loved to be able to get a replacement transformer by the way, but I have yet to come across one on any page. Seems like individual parts are even harder to find. What are the specs for the transformer? what do you mean with specs? It doesn't really say that much. It's that yellow and black block that says K559 t AVAIL. When it first broke I looked it up on the Internet and found absolutely nothing.